Alexander the Great was a young general who amassed the largest empire of the ancient world in just thirteen years. His career was brief because he died a young man, but Alexander’s legacy was a blending of cultures we now call the Hellenistic civilization. 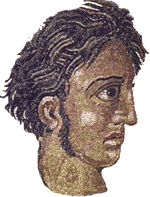 Alexander’s father was King Philip of Macedonia. Macedonia is a mountainous land north of the Greek peninsula. From a young age, Phillip trained Alexander in warfare and by the age of sixteen, the young man was leading an army on his own. 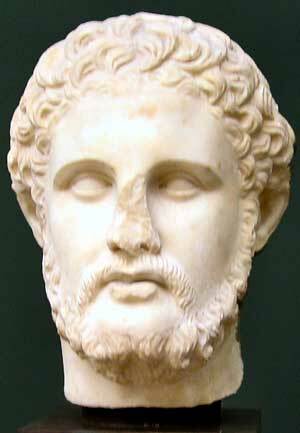 Alexander succeeded his father in power at age nineteen after Philip’s assassination in 336BCE. Philip’s armies had conquered most of the Greek poli by that time, but the Greeks believed they could free themselves of Macedonian rule since their new king was a “mere boy." Alexander proved the Greeks wrong by leading an army that captured Thebes; the young general burned all but one home in the polis as a warning to the other Greeks. Alexander then turned his attention to Persia, the longtime enemy of Greece and the mightiest empire in the world at that time. Alexander destroyed Thebes as a warning to the other Greek poli. In 333BCE, Alexander led an army of 40,000 soldiers, 30,000 sailors and 100 ships into Asia Minor (present-day Turkey). Alexander’s forces conquered several Persian provinces before turning south to face the army of Persian King Darius III. 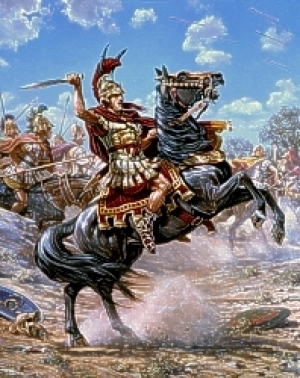 Alexander’s army was less than half the size of the Persian forces, but the Macedonian outmaneuvered the Persians, causing Darius to flee the battlefield. Alexander captured the wife and daughters of Darius. The young general treated the Persian king’s family with great respect and the woman accompanied him for the rest of his life. Alexander moved south to Egypt in 332BCE. 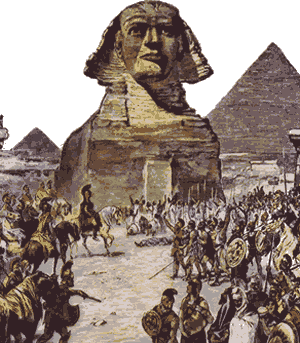 The Egyptian people welcomed the conquering general as a hero. They declared Alexander a pharaoh and a god because he freed them from harsh Persian rule. The young general founded Alexandria, a city that would become the greatest center of learning in the ancient world. A library in Alexandria housed the accumulated knowledge of the Greeks. The library operated until the seventh century of the Common Era, long after the fall of the Greek and Roman civilizations. Alexander marched his army east where they again defeated the forces of King Darius. Darius again fled the battlefield, but the Persian king was killed soon after by his advisors. Alexander’s army looted the Persian capital at Persepolis, but the young general divided the treasures of Persepolis among his soldiers, making the men richer than they could have ever expected to be. Although a young man, Alexander was a military genius, possibly the greatest warrior of all time. His troops were better trained and organized than the Persian army. Alexander’s soldiers admired their leader because of his personal courage. Alexander led his soldiers in battle instead of remaining behind the lines. The troops saw that the young general was sharing their danger and was not asking them to take any risks he would not take himself. As a child, Alexander was tutored by the Greek philosopher Aristotle. Aristotle taught Alexander that the Greeks were the most advanced people in the world and that all other cultures were barbarians. Once Alexander conquered the Persians, he had a change of heart. Alexander adopted many Persian customs. He took the Persian title “King of Kings" and married one of the daughters King Darius abandoned on the battlefield. Alexander’s army marched as far east as the edge of the Indian subcontinent in 326BCE, but the heavy monsoon rains and a revolt among his soldiers forced the young general to end his conquests. Alexander changed the world, but not through his accomplishments on the battlefield. Alexander’s empire combined Greek culture with the customs of Persia and the other lands he conquered. Later historians called this combination of cultures the Hellenistic civilization. Hellenism is a word derived from the Greeks’ traditional name for themselves. Long after Alexander’s empire fell apart, Hellenism produced great advances in science, philosophy, and drama. Alexander became a king after the death of his father, Philip of Macedon in 336BCE. 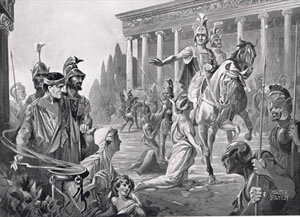 When Alexander arrived in Egypt, he was greeted as a hero by the grateful Egyptian people. Alexander the Great came from Macedonia, the mountainous land north of the Greek peninsula. The Macedonians spoke a variant of the Greek language and worshipped many of the Greek gods, but many peninsular Greeks considered the Macedonians to be old-fashioned and ill-mannered. The Macedonians preferred hunting to the athletic contests of the peninsular Greeks. The Macedonians herded horses and cattle while many peninsular Greeks lived in cities called poli. Alexander the Great was the third Macedonian ruler with that name. The first Alexander ruled in the fifth century BCE, nearly one hundred fifty years before the age of the great conqueror. Alexander descended from the Macedonian mountains to compete in the Olympic Games. Many of the judges would not allow a participant from a barbarian land to participate in the games, but Alexander was able to convince the Olympic Court that he was familiar with Greek culture and traditions. Aristotle’s father was the personal physician to the king of Macedonia. Aristotle grew up in the Macedonian king’s palace, but he left for Athens after the death of his parents to study at Plato’s Academy. The philosopher later returned to Macedonia for three years tutor King Phillip’s son, Alexander. Phillip and Aristotle led armies that conquered most of the Greek poli, but many peninsular Greeks disdained the Macedonians. When Phillip was murdered, the city of Thebes revolted against their rulers. Alexander burned the city to the ground, killing 6000 people and taking the 30,000 survivors as captives. After the destruction of Thebes, the peninsular Greeks never again attempted to challenge Alexander. Aristotle taught Alexander that the Greeks were superior to all other cultures, but in his adult life, Alexander learned to respect and admire people from the other cultures he encountered. Historians later called the mixing of cultures that resulted from the conquests of Alexander the Great the Hellenistic civilization.